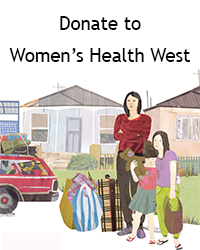 Women’s Health West is committed to improving equity and justice for women in Melbourne’s western region. We deliver family violence services and undertake health promotion actions. To escape family violence, phone us on 9689 9588 (Mon-Fri 9am-5pm) or email us on fvassist@whwest.org.au. To speak to someone outside of business hours, contact Safe Steps Family Violence Response Centre on 1800 015 188. If you are in immediate danger call the police on 000. If you need an interpreter, first call the Telephone Interpreter Service on 131 450. The donations we receive are vital. They help us to support women and their children to live safe, healthy lives. Even small donations can help us to make a big difference to the lives of women and children in the west.